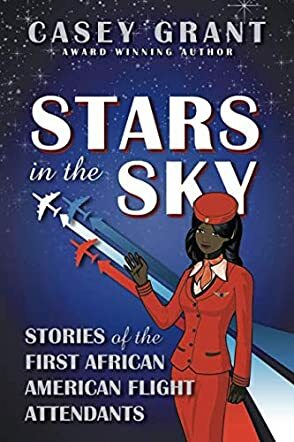 Stars in the Sky: Stories of the First African American Flight Attendants is an autobiography by Casey Grant who, in 1971, was one of a handful of young black women hired by Delta Air Lines as flight attendants, when the career field was predominately white. (The first black flight attendant at Delta was hired only five years before.) Beginning with her childhood as a “military brat,” and her attraction to what was viewed as a glamorous career field for women that offered good pay, travel, and other benefits, Grant describes her experiences at a time when racial discrimination made it hard just to find a place to live, let alone causing some struggles in the workplace. In addition to her personal story, Grant tells the stories of the first black aviators and other black pioneers in the aviation industry. The book is illustrated with several photographs. Stars in the Sky is a fascinating story on several levels. First, it’s the life story of a young black woman as she helps to integrate a career field. Second, it’s a glimpse at changes in the aviation industry over more than three decades. Third, it’s a commentary on the dramatic changes in American society that took place over that time frame. Grant writes in a conversational tone, and is frank and honest in her approach and style. After I finished the book, I wondered if I was ever on one of her flights, or the flights of any of the other black flight attendants or pilots to whom so much is owed. As Grant wrote about one of them: “Our predecessors were the first ones to desegregate the skies and not only bore the brunt of prejudice but also were the ones who disarmed it.” An entertaining, educational, and inspirational read. I really enjoyed the book. Ill be telling my friends to read it. I'm going to recommend that my local library get this book. This book was so enjoyable and I learned a lot. This was black history that I didn't know about. Very informative!